Why You Need to Try FAR-Infrared Body Wraps Today! Many people love the turning of the colors. The brilliant reds, oranges, purples, and yellows are a wonderment of nature not to miss. Every year it’s magic. It’s a time of pumpkins and football and cooler temperatures and darker days. While some people love fall, some people dread it. The darker days make you harken to your home sooner and cuddle up with a good book and a blanket. The cooler temperatures may nix your outdoor plans, and eventually these temperatures will dip so low you won’t even want to go outdoors. Furthermore, fall is a busy season. Traditionally, it was a time of harvest where all hands were needed to bring in the crops before the first frost and snowfall. Now, fall means a return to school, an end to many of your favorite activities, and a mini-hibernation indoors. Seasonal affective disorder (SAD) or “the winter blues”, a depression caused by the changes in seasons, starts in the fall and continues throughout the winter months. Your desire to accomplish anything is sapped as well as your peppy mood. A good time for detoxification treatment is in the spring when it’s cleaning time. Safe Laser Therapy in Stamford, CT, recognizes that these seasonal changes lead to an abundance of toxin accumulation in our bodies. These toxins wreck havoc on our bodies from causing hormonal imbalances, weight gain, changes in metabolism, skin disorders, and more. We can feel “icky” all the time and not understand why. You need to detoxify your body, and we believe FAR-Infrared Body Wraps is the solution. First, your skin is exfoliated, and then you rinse off in a shower. Next, your body is coated in the wrap ingredients, which depends on what you are targeting (maybe seaweed, mud, clay or an herbal or fruit product), covering it with a layer of plastic wrap. 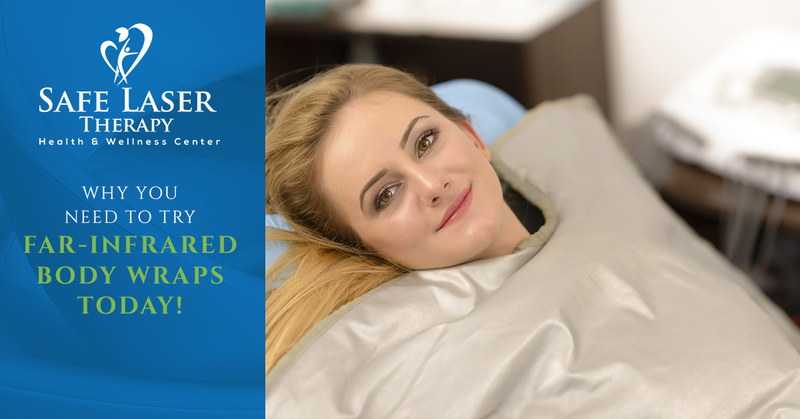 Thermal wrappings, probably towels and blankets, are then wrapped all over the treatment area where you lay–and sweat–for approximately 30 minutes. The treatment is then washed off, and the treatment areas will be rubbed in (similar to a massage) with a special lotion to amplify the effects. There are different kinds of ingredients that all depend on what you are targeting. For detoxifying, you’ll be coated in a mixture of algae, seaweed, mud or clay. These ingredients stimulate the skin and circulation, ridding your body of toxins, and replacing them with vital minerals you may be missing, improving your overall health and well-being. WHAT ARE FAR-INFRARED BODY WRAPS? FAR-infrared Body Wraps are the state-of-the-art FAR-infrared heat, which is the same heat from the sun. All warm blooded animals (including humans) generate this type of heat naturally to warm themselves. Infrared heat penetrates our bodies, rather than only heating the skin. FAR-Infrared heat sessions cause you to release as much as 15% more toxins than traditional body wraps done without heat. These toxins such as alcohol, nicotine, and heavy metals accumulate in the body just from daily life. Infrared body wraps speed up this process and is the only way to get rid of these harmful toxins naturally. Infrared body wraps have many other benefits as well such as loosening muscles, increasing blood circulation, burning up to 1400 calories, and promoting body contouring, weight loss, and reducing stress. Contact Safe Laser Therapy today to schedule your FAR-infrared heat session in our Stamford, CT, office. Combat SAD and the winter blues by treating yourself to a proven therapy for overall health and wellness!